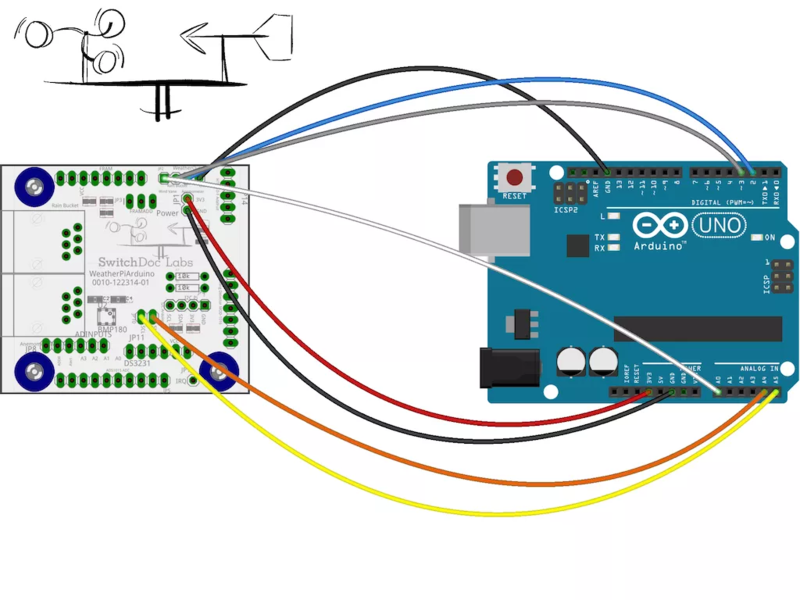 I tried to build a weather station with anemometer and My setup is, SwitchDoc Labs' anemometer kit (which is equivalent to sparkfun anemometer kit) connected to the grove weather-pi board with rtc clock DS3231 installed on which is connected to arduino UNO. And the supposedly working sketch/library is https://github.com/switchdoclabs/SDL_Weather_80422 which only compiles on arduino-IDE without issue if I use the fork https://github.com/soligen2010/Adafruit_ADS1X15 instead of the original https://github.com/adafruit/Adafruit_ADS1X15 with it but even then the wind-speed and wind-direction unit or to say the whole anemometer part just do not work or in other words, do not give any reading. I have tested the units individually up to the arduino pins with LED light on breadboard, they are sending signals/responding and also mounted the whole project on a Mega2560 as well but results remained unchanged. Where the pinAnem and intAnem both indicates pin 2 for UNO according to the above two diagrams. When I connect the I2C vcc pin from grove-weather-board to UNO's 5 volts instead of 3.3 volts as shown, the wind direction gets fixed but still no wind-speed reading. So what are the corrections I need to do in the SDL_Weather_80422 library or in the connection diagram in this case? According to the above setup only rain bucket unit works. And as jsotola mentioned both the anemometer and the rain bucket sensors are simple switches, so a simple sketch can be written that reads the switch state and light LED (pin13) if the switch is activated and turns off LED if switch is not activated and that can be done for each of the switches separately. But instead I took a shortcut. The wind vane part (on analog pin A0) starts working only when I connect the I2C vcc pin to 5 volts pin instead of 3.3 volts pin of UNO. 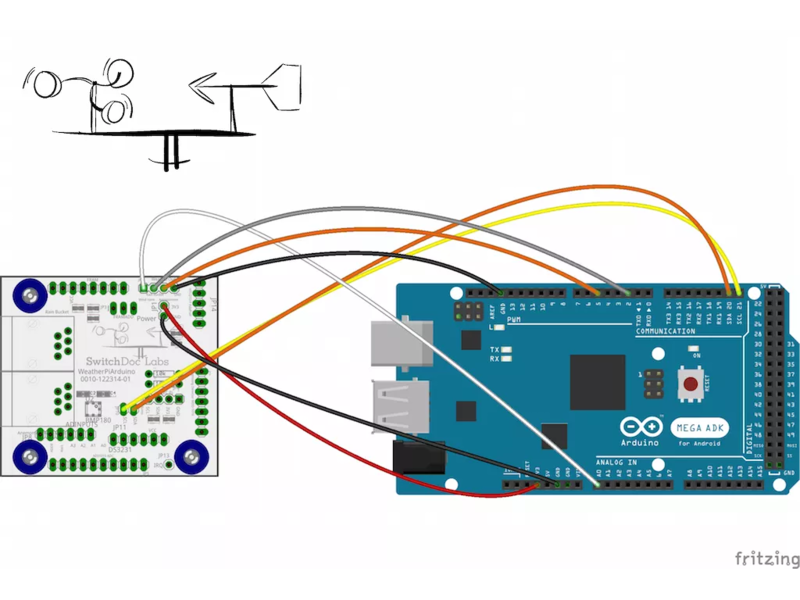 Had to ditch the https://github.com/switchdoclabs/SDL_Weather_80422 library's wind_speed reading method and adopting and merging into the http://cactus.io/hookups/weather/anemometer/davis/hookup-arduino-to-davis-anemometer-wind-speed code and adding up the wind_gust function from https://github.com/sparkfun/Weather_Shield/blob/master/Firmware/Weather_Shield_Weather_Station_V12/Weather_Shield_Weather_Station_V12.ino makes the anemometer with rain-bucket with the exact same setup fully functional. Not the answer you're looking for? Browse other questions tagged arduino-uno arduino-ide adafruit or ask your own question.